Very quick delivery as well. Item was delivered as promised and fits well while still being easy to remove when required. Happy with the choice as it offers great protection. This is the first product when ordering online that truly was the correct item for my phone. Good fast delivery, well done. It's a phone cover. It covers my phone. Provides a much better grip on the phone. No slipping since I fitted the tough case. As described. Perfect for my phone. The stand is a handy little feature. Robust and definitely worth the money. Delivery is quick and ordering is easy. A little uncomfortable to hold but does the job. Would be perfect if it came with a screen protector. The second time I have bought one for a mobile phone. Extremely robust. Good value. Love the blue colour too! Certainly helps to protect a decent phone. This case is excellent. It is easy to grip in a pocket with gloves on. I would have appreciated a screen protector in the pack. Hard plastic case, has a nice grip feel although it's a little slippery. Perhaps it's because i have dry skin. Phone already been dropped a few times and nothing broken, that's a positive. Good sturdy light, nice grip, easy to stand case which can seperate from the stand if you like and still be encased. Delighted with my purchase. Arrived very quickly, fits like a glove and looks very cool. Dropped the phone the next day and was so glad I purchased this protective cover and can recommend it to anyone. ??????????? ?Perfection and well worth the wait???????????? The Armourdillo case is exacctly as I expected.. it's lightweight and the stand which is situated on the back of the exoskeleton is in a place that is easily used secondarily as a resting place for your finger when you're holding your phone in vertically in your hand.. it feels so good in my hand.. I am finally finished with the crazy mobile phone case search. I won't probably ever use any other product.. Saved both times. Don't use the pen thing but gave that as a gift. Car mount holder is fave item. But should be a coloured tag for eg on pull tab to release suction. My son was getting his first mobile for christmas and has a pretty bad track record for breaking stuff so I was a bit worried about him getting one. I saw this case and it looked really tough and also a fun design with a little stand so he can stand it up when watching youtube vids etc. When the case arrived I put it on his new phone and it really looked great and super tough and protected. I wrapped up the phone for him with the case already fitted so he would have no opportunity to drop it or crack the screen before the case went on. I also put a screen protector on the front.When he opened it christmas day he was thrilled and said he really liked the case. I had one of these for my previous phone.it is excellent. It is rugged and provides good grip and can easily found in your pocket. My wife had bought me an expensive fancy cover but I immediately bought tbis one. This case is easy to fit, looks great and provides good protection. Inbuilt phone stand works well and clips safely away when not in use. Good snug fit and gives the phone good grip. It protects the back of the phone and the sides, including the buttons, but the plastic is not rigid enough to give vertical strength when the phone is laid flat. So I would describe it as more protective than tough. I bought this for my Daughter as she recently upgraded her cell phone and looked everywhere to find a cover to protect it with no luck. I then found Mobile Fun online and found you had a case for her phone. So right away I ordered it and had it shipped to her. She received it within 7 days in the mail and was so excited it fit like a glove, when I ordered it I should have also added the screen protected too but she will look for that one if she cant find it I will be ordering it from you again. Thanks for the good experience with support also. Positives: Case a very good fit with all functions accessible. Light and neat, so not adding too much to bulk of phone. Improvements: main body covered in rubber so less slippy in hand or on tables etc. I bought this for hubby as I'd recently purchased him a new phone. However he is not one for cases and then often drops phones causing damage. This time I suggested he perhaps consider a case since this new phone cost a great deal more than any other one I'd previously purchased. He found this case online and now he is using it, tells mem it is a great little case as he can use the stand on the back to sit it on a table, and it doesn't slip out of his pocket. He likes the design as well because it reminds him of his late father who was in the military. The item is exactly what is advertised. Hardy mobile cover that won't damage my phone especially in my type of job. Love it! After the product did not turn up. Customer service fast tracked another here in four days. Product great. Dropped from shoulder height a couple of times with no damage. Get the slightly small than full size screen protector with this product. Full size falls off. Arrived promptly and as was described. Have been using and am most satified. Very tough case with total protection, add a screen protector from the same company and your fully covered. I get one of these for each phone I buy and have never had a breakage, not bad as I work on construction sites. Phone case feels strong and sturdy, fits well. 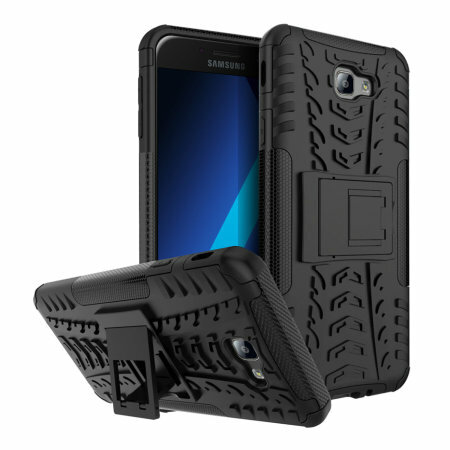 Was looking for Samsung A5 cases, and most were coming in expensive. Spotted this little beaut and snapped it up like the expert magpie that I am - what a smart move from me. Good grip, nice design, handy little flip-stand included on the back. Move over David Dimbleby, you know there's a new master bargain-hunter in town. I don't want to blow my own trumpet, but if you consider yourself a connoisseur of getting good stuff on the cheap (like me), you'll be pretty satisfied with this bad boy. No drop testing, but it seems well designed for the task. I have dropped the phone once on concrete and the case did it's job. The corners are well protected, but it would great if the front didn't sit almost flush with the phone screen. I have a screen protector but I would have loved this case to offer some sort of screen protection. Fantastic sturdy cover from Mobile Fun! Very pleased with recent purchase of Armour Dilo cover, it fits perfectly and love the useful hinge at back to stand mobile up with for better sound and vision. Will definitely come back to mobile fun in future, happy customer! having bought a new phone and dropping it within 12 hours ,breaking the screen and having a £150 bill to fix it I was very pleased to receive the phone protector from mobile fun. it is an excellent cover ,well built and excellently built to protect the phone should you drop it. also the cover is great to hold and is perfect for grip. the phone buttons are easy to use and I would recommend this item to anyone looking for a cover for their phone.also the service from mobile fun was excellent. I am very happy with my purchase of the Olixar ArmourDillo Tough Case. It feels strong and will hopefully protect my phone if it's dropped. I like the colour, it was just as pictured on the website. Although it took a while to arrive I am very pleased with the quality. I am rating 4 stars because I have not yet witnessed how it will be if I drop my phone. Despite a mix up on the original order, which was satisfactorily resolved, the Armadillo case for the Samsung 5 Is an excellent protector. Not many armoured cases out there for the A5, have normally bought Otterbox but they don't produce one. Well, their loss is Olixar's gain - this case is great and I would recommend it to anyone. I read lots of reviews on different sites about different cases. "This can't be that good for the price, surely?" I thought but it regularly came up as top rated - and here we are. I chose the blue and black to make it a little easier to find, all black cases tend to blend in! Love the twist on the word armadillo too. Bought this protective case for my wife's new mobile and she's delighted. Hope it won't be long before Olixar market an armourdillo case for my new BlackBerry Keyone! This case is really great, I drop it all the time and my phone is always safe. My husband purchased this mobile case and I was very impressed with it's appearance and the protection it provided. I had just bought a new phone and although I had bought a flip case for my old phone, which I've got to say, did protect my phone,it did get in the way when taking photos etc. This case ticked all the boxes as not only does it protect your phone, it has a pull out clip at the back which you can use if you wanted to watch something or listen to music hands free. I would recommend this at a reasonable price with excellent protection and quick delivery. You said go for the faster freight service. I went for snail mail and that's what it was... But my phone cover arrived and it is a great product! Since this I have ordered 3 more products from you and will receive these via DHL.